PALM BEACH GARDENS, Fla., June 5, 2018 /PRNewswire-USNewswire/ -- European Interbalkan Medical Center (http://www.iatrikodiavalkaniko.gr/en) in Thessaloniki, Greece, a part of Athens Medical Group has been awarded a three-year term of accreditation by the Global Healthcare Accreditation (GHA) Program (http://globalhealthcareaccreditation.com/) for its Medical Travel Services Program. 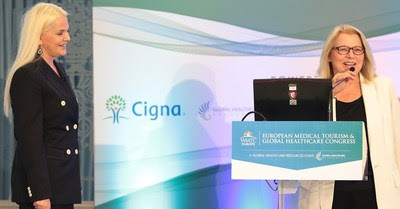 European Interbalkan Medical Center is the first hospital in Greece and the second hospital in Europe accredited by the GHA program. The European Interbalkan Medical Center of Thessaloniki is one of the largest and technologically sophisticated private hospitals in northern Greece and has been included in the "Best hospitals worldwide 2014 & 2015" and "Preferred Partner Hospital 2016, 2017, 2018" lists by the Diplomatic Council (DC), United Nations. It is a member of Athens Medical Group, one of the premier healthcare service providers in Greece. European Interbalkan Medical Center's accreditation by GHA was announced at the recent European Medical Tourism Congress in Athens, Greece, where Dr. Christina Doubali, Director of the International Patient Center at European Interbalkan Medical Center, participated in a session titled "Accreditation in Medical Travel Driving Patient Excellence," moderated by Karen Timmons, GHA's Chief Executive Officer. In 2016, the Global Healthcare Accreditation (GHA) Program was established with the goal of enhancing the patient experience for medical travelers across the entire Medical Travel Care Continuum. GHA provides concrete and measurable value to patients by ensuring that the hospital or clinic has instituted processes that are customized to the medical travelers' unique needs and expectations and are constantly monitored for improvement. Additionally, GHA provides healthcare organizations with a unique opportunity to not only acquire skills and competencies designed to strengthen their medical travel services, but also impact business performance. GHA has accredited recognized healthcare providers in Croatia, Mexico, Thailand, Saudi Arabia, The United States, and now Greece. According to Dr. Cristina Doubali, "European Interbalkan Medical Center, one of the eight hospitals belonging to the Athens Medical Group, is one of the leading hospitals in Europe and a top destination for medical travelers seeking high quality healthcare services. Through our International Patient Center we offer traveling patients and their relatives a wide-range of services including personalized assistance, language services and financial coordination throughout the entire patient journey. Our patient-centered approach is combined with cutting-edge medical procedures, which adhere to the strictest international quality criteria, and is provided by highly-qualified doctors, with training and experience gained from medical institutions in Europe and the US. We chose Global Healthcare Accreditation as it focuses on enhancing the entire medical travel care continuum, and ensures we have the right processes in place to consistently deliver a high-quality patient experience." Karen Timmons, Chief Executive Officer of the Global Healthcare Accreditation Program stated, "The assurance of quality and transparency in medical travel goes beyond the care delivered in the actual healthcare facility – it starts from the point of inquiry for the service and destination through arrival to the destination, and admission, discharge from the organization and stay at a hospitality site prior to travel back to the home base and through to ongoing communication after follow up service has been provided. The GHA Program, with its independent board and Regional Advisory Committees comprised of broad representation of key experts and stakeholders, seeks to bring clarity, and consensus around important issues facing medical travel, improving the patient experience and excellence of care. We congratulate European Interbalkan Medical Center and Athens Medical Group for achieving GHA Accreditation and for its commitment to supporting the needs of medical travel patients." The European Interbalkan Medical Center has 383 hospital beds and offers a full range of healthcare services. Apart from the facilities of the General Hospital, patients have access to the Paediatrics Clinic, the Maternity-Gynaecological Clinic and the IVF and Infertility Center. A Rehabilitation Center also operates within the Hospital. The Hospital is located next to Thessaloniki International Airport "Macedonia", which is the second largest airport in Greece. Αναρτήθηκε από geop στις 10:49 π.μ.